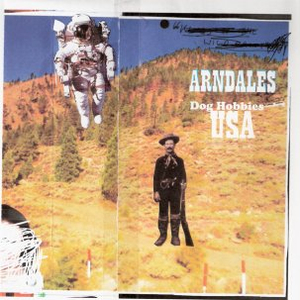 ARNDALES consist of four men whose ages range from 42 to 51. Notable bands / artists with which they have been / are involved: COUNTRY TEASERS, THRILLED SKINNY, BADGEWEARER, GAG, MONTANA PETE, PREGNANT NECK, COLLAPSED LUNG, ZUNO MEN and JAD FAIR. They?re menacing, menacingly good, regional treasures, stalker, very dangerous stretches of road, and I hate noise and scandalous handmade postcards. This is good, black crosses for eyes. Frantic, frenetic, edgy, disturbing, scratchy low-end menacing new wave. The whole presentation is something to be desired. John Peel would have played this lots. This band should be on your list, these songs should be on the list, that line should be on your list. Angular but not in that obvious way, solid, national statues more Fall than Franz. Great songs, menacing songs, new wave with excellent benefits and reading books, shared common interests, ancient Greeks, iced tea.